In an era of hair phobia where men are manscaping and women are getting more off than the traditional “landing strip”. I decided to try out some very convenient ready-wax products. Personally, I think removing ALL your pubic hair is both un-hygenic (it’s there partly to protect you from bacteria and lower your chances of STDs like genital herpes, warts etc. by offering a buffer between your skin & partner) but also I think pubic hair is fkg natural and there is something warped even pedo-ish to prefer bald genitalia… That being said, no one likes a pubic hair sandwich, so I do enjoy a nice trim on a man and def keep my southern gardens short and tidy.. The traditional buzz clipper is ideal I find for the maintenance along with laser hair removal or the less permanent and cheaper waxing. As spring is here and summer is near, I decided to try some convenient ready-to-wax kits on my bikini line. I used a different kit on each inner thigh (mostly because I accidentally purchased the 2 kits at the PHARMAPRIX!) Left leg was Veet and right leg was Epilvite. Veet was $13.99 + tax for 20 strips while Epilvite was $18.99 +tax for 40 so I was hoping Epilvite would be the better one too. In the picture, the one with the instruction is by Veet and the other Epilvite. I preferred the Epilvite, given that the technology was so clever. You get 20 strips of wax glued together and you remove them by separating them and creating 2 strips. The only problem with that you have to put both strips on at the same tine, or CAREFULLY place a waiting strip somewhere, face up. 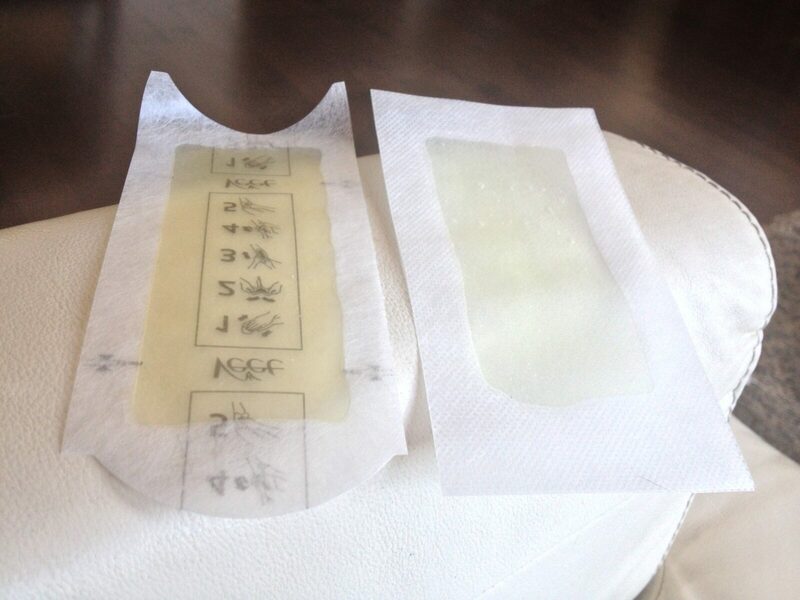 The Veet had a plastic protector that once removed, sometimes removed valuable wax! Epilvite won this round. Both were equally good at removing hair. The pain was less with Veet, and I’m not sure why because both removed hair effectively. Also Veet has little pulling shapes, which makes pulling the strips off a little easier. They were both painful though, I should have prepped with an Advil and a glass of wine! Neither were very messy which is the beauty of these ready peel strips. You simply wax off and pile the used strips somewhere like a piece of old newspaper. The Veet came with these oily after-care wipes which made a bit of a mess (I stained a sofa pillow with 1, but it washed out). That says more about me being messy than the product though! Overall, I would buy the Epilvite again. Also it contains aloe and it’s the only one that advertises the ability to remove coarse men’s hair too for my metro n homo friends 🙂 bikini line on both legs is the same today (did it yesterday) smooth with very little bumps or redness. Breaking beats & hearts with C2C! Initiative Q | 5 Reasons to join the Revolution! Does my band really need a TWITTER?